Two lovely guests had coffee and biscuits with me in my witch room earlier this week. Wendy Stacey of the Astrological Association and Kim Farnell of the Astrological Lodge of London stayed for a chat when they came to collect some precious papers to be scanned for posterity. The papers are Alan Leo's correspondence courses in astrology. My grandma, May Robbins, was the famous astrologer's secretary and typed up all the material that was sent out to students. This would have been about 100 years ago, so long before photocopiers. Each lesson posted out had to be returned by the student when they had finished with it so it could be sent on to the next person. As you can imagine, there weren't very many copies produced. 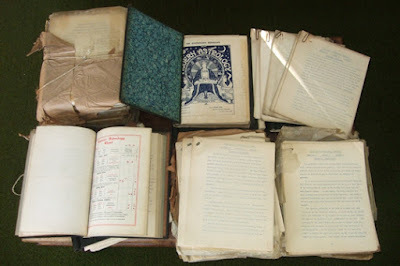 It seems that the papers I inherited from my grandma might be the only complete set of Alan Leo's astrology courses still in existence. I am very pleased they will soon be available in a digital format and won't be lost. 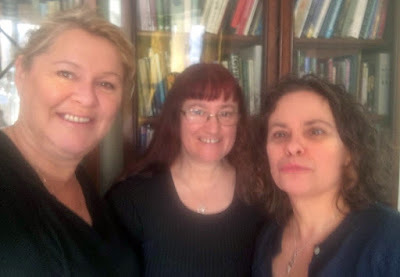 It was lovely to chat with Wendy and Kim, who you can see in the photo at the top of this post - taken in front of one of the bookcases in my witch room. The picture at the bottom shows Alan Leo's papers on the my table before being boxed up and taken to be scanned. One of my new year resolutions for 2018 was to blog about some of the things in my witch room and also some of the things I've been getting up to there. I first did a post of that kind back in 2016, when I wrote a post about decorating the room. This year, each month, I am writing further posts.